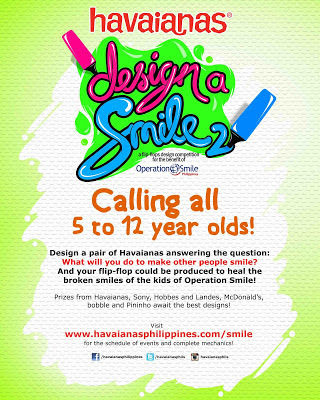 This November to January, Havaianas Design a Smile 2 is back, with the theme “Paying it Forward: Kids Helping Kids.” Beginning November 24th, artistically inclined kids can join Havaianas Design a Smile by submitting their designs illustrating their answer to the question “What will you do to make other people smile?” at partner events nationwide, beginning with the Bonifacio Global City Passion Fest at Bonifacio High Street from November 23 to 25, and at the Mommy Mundo Bazaar at the Rockwell Tent from November 24 to 25. Winners will receive exciting prizes from Havaianas, Bobble, Pininho, Hobbes and Landes, McDonald’s, and Sony. The grand prize winner will also have his or her design produced as part of the Havaianas 2014 Collection as the Havaianas Smile pair, with a percentage of the sales from which will help fund the operations of Operation Smile. Havaianas Design a Smile 2 kicks off at the Bonifacio Global City Passion Fest at Bonifacio High Street, Fort Bonifacio Global City, Taguig from November 23 to 25, and at the Mommy Mundo Bazaar at the Rockwell Tent, Rockwell PowerPlant Mall, Makati City from November 24 to 25. Like the Havaianas Philippines Official Facebook page at www.facebook.com/havaianasphilippines/ to find out other events that the Havaianas Design a Smile 2 booth will be visiting.